This summer is very odd for me, in that I've actually got more time than I know what to do with. 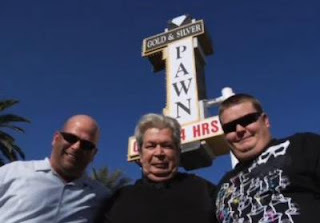 I turned on the History Channel, which I never do, and came across this very cool show called, of all things, Pawn Stars. Then I found three seasons of it on Netflix, and I've watched maybe eight episodes. It's really interesting seeing the things people bring in, what they are worth, and then watching people haggle over it. The haggling makes it more interesting than the staid Antiques Roadshow on PBS. So if you're stuck home, as I am, on call to drive family members around, NYC Educator gives two thumbs up to Pawn Stars. Have you got any guilty summer pleasures? Please share them in the comments!